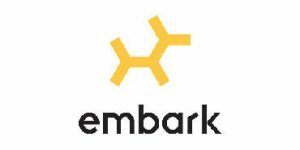 Embark was founded by Adam and Ryan Boyko, two scientists who dedicated their lives to discovering the genetic foundations for many dog diseases and traits. Our Embark review will put the embodiment of their research to the test and inspect the results of their life-long work. Embark greatly differs from other dog DNA testing companies. The company really cares about the well-being of our animal family members. It constantly collects data by working closely with numerous breeders and veterinarians. Partnering with Cornell College of Veterinary Medicine also gave Embark an excellent platform for researching how to improve dog wellness. You start off by ordering the DNA test kit online. The shipment will leave the company’s warehouse within 1-2 work days. The test kit will contain cheek swabs and detailed instructions on how to swab your dog. Once you have the DNA sample, activate your kit online and mail the specimen back to Embark’s lab in the provided packaging. Interactive results will arrive between 3 and 7 weeks after the lab receives the samples. 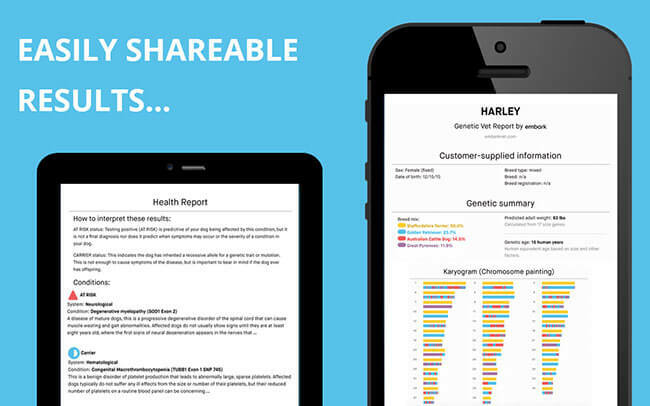 The results can also be viewed on your phone through the Embark app. Embark is so much more than a simple dog DNA testing company. It’s the life work of two dedicated scientists, whose entire careers are all about improving the health and quality of life of dogs. There are many more factors that merit our attention, we just focused on the most prominent ones. Embark is definitely a dog-friendly institution in every possible sense of the word. Embark’s main test aimed at the general public is simply called the Embark Dog DNA Test. Apart from the most commercial product, the company also offers a specialized test for breeders. The test covers all the potential points of inquiry you might have about your dog. The current price is 199$, but there are discounts when testing multiple dogs (10% discount for 2 kits, 12% for 3, 20% for 4 and more kits). The test was developed by experts in veterinary medicine and it is widely accepted by professional veterinary hospitals and dog breeders. It is also approved by the Orthopedic Foundation for Animals (OFA). Breed identification and ancestry research – Embark tests your dog’s DNA for traces of more than 250 different breeds, allowing you to get a perfectly accurate breed identification for your pet. The ancestry part of the test reaches back to the great grandparents of your dog and it will be depicted via a comprehensive family tree. The test also takes coyote, village dog, and wolf ancestry into account. Also, this is the only test that recognizes village dogs at all and can tell you all about their origins. The full list of breeds can be viewed on the site. 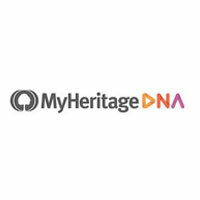 The ancestry test also analyzes mitochondrial DNA and the Y-chromosome. This can uncover the story behind your dog’s paternal and maternal lineages, with a comprehensive map of their geographical journey through time. In other words, you’ll also find out your pet’s haplogroup, haplotype, and the migration patterns of its ancestors 15,000 years into the past. Health reports – The health of your dog starts with its genes. Performing an adequate DNA test is a crucial factor in extending the healthspan (and consequentially lifespan) of your 4-legged friend. Embark tests for more than 165 genetic health conditions, covering all major systems in your dog’s organism. Lifespan and healthspan being two different things, your dog might have to quit things it enjoys long before its lifespan is over. Dilated cardiomyopathy, degenerative myelopathy, and glaucoma form the most common group of diseases in dogs and knowing about your dog’s genetic potential in advance can make your vet’s job much easier and more successful. Perfect test accuracy – Embark dog DNA test explores more than 200,000 genetic markers, which brings one of the most accurate breed identification on the market. Pinpointing the exact mix of ancestors helps to focus on the diseases most likely to affect your dog. Genetic age – Through the genetic traits of your dog, its aging process, and body size, it is possible to determine its genetic age. This is basically a translation into human years. The myth about dog years and aging is just that, a myth. Comprehensive recommendations for your dog’s care – An accurately established genetic age will allow your vet to customize recommended food and treatments for your dog. By examining 17 genes critical for the dog’s size, your vet will know exactly how big it’s supposed to be and whether it’s overweight for its age. Half of all dogs in the US are overweight, which hastens osteoarthritis and similar metabolic complications during senior years. Embark has its own team of professional nutritionists, who will make a plan of nutritional recommendations for your dog based on its unique genetic needs. Also, different genetic compositions require different forms of exercise. Embark’s test will help you and your vet define the best activity for your pup. The Neapolitan Mastiff will definitely need a different set of exercises compared to, let’s say, the Border Collie. The price is 179$ per kit and there are discounts available for bulk purchases. The kit provides both a breed-specific test and a trait test. The results will offer insights into breeding for specific size, coat color, and texture. The results also aim at helping you keep the best genetic health for your dog’s line. Other instances are the same as the basic commercial test. Veterinarians can opt for the possibility of partnering with Embark and selling dog DNA tests in their clinics. Embark offers setting up a life-long plan for the newest clients, as well as wholesale pricing, so their vet partners can also make a profit. The prices aren’t listed on the website, so you’ll have to contact Embark to find out more about this possibility. Embark constantly strives to improve the life of dogs. Every test provides valuable data (when the owner allows it, of course), aimed at making new breakthroughs in the field of veterinary medicine and canine genetic science. Once given consent, the data is shared with scientists all around the world, working on hundreds of projects simultaneously. The other side of the coin holds Embark’s involvement with dog shelters in the form of financial aid, as well as logistic and scientific support. Embark values your privacy and it will not share your or your dog’s data with anybody unless you provide an explicit approval. However, it strongly encourages its users to provide data access for aggregated, non-identifying research purposes. If you’re not interested in such a thing, you can opt-out when placing an order. After you’ve placed an order, the test kit will be dispatched from the warehouse within the next 1-2 business days. Note that Embark also ships its testing kits to international addresses. The company states that the arrival time may vary depending on your geographic location. Shipping is free, however, and the kit includes a prepaid envelope for mailing the specimen back to the lab. Embark is one of the youngest companies of its kind, being founded a couple of years back. Being that young, however, hasn’t stopped people from already calling them “23andMe for dogs.” Embark was a successful startup, which gave birth to a passionate and professional Austin-based dog DNA testing company. Our dedicated Embark review has shed enough light on the company to see a brotherly tandem dedicating their lives and professional careers to dogs and their well-being. The test it offers is the marvel of modern genetic science, providing vital information for dog breeders, veterinarians, and proud owners. All that’s left to say is that Embark is definitely here to stay. It does have some work to do, but what it did in such a short time period is definitely impressive. Our ratings are the result of an objective and independent evaluation of Embark, generating the final rating that reflects the overall quality of the company. Ratings may change as the service changes. Embark user rating based on 7 user reviews. My little snowball is reaching his doggy old age and i did the Embark test to see if he's in risk of some illnesses. Luckily it's just little too heavy for its own good, but we'll work on that. Great service and a really doggy friendly experience. Pretty neat, but more expensive than some other tests i ordered. I really liked all the tutorials and videos, and the instruction they send you with the kit. They're really holding your hand through the whole thing. We found 1 verified Embark discount for April, 2019. If you like Embark but aren’t sure whether they are truly the ideal choice for you, you may want to take a look at our comparisons below to discover if one of their competitors is more suitable for you. The world of genetics, biotechnology, and at-home DNA testing is vivid beyond measure and brimming with never-ending news and updates. Browse our Embark news section below to stay up-to-date with its latest features, service improvements, opportunities to take part in genetic research, all sorts of corporate projects, and much more.